St. Louis Holiday Inn Express hotel is near the Barnes Jewish Hospital. 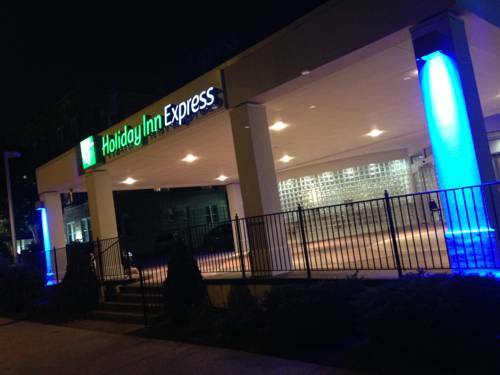 Come and stay at the recently rejuvenated Holiday Inn Express St. Louis Central West End. Whether traveling for business or an overnight stay, this St. Louis, Missouri hotel provides premium guest amenities, excellent service and convenient access to explore area attractions. Youll enjoy a comfortable stay at our smoke-free Historic hotel less than a mile away from the well-known Forest Park neighborhood. We are located near the Barnes Jewish Hospital and 11 miles from the STL airport. Spend the day relaxing inside the comforts of your hotel room or visiting attractions like the St. Louis Zoo, the St. Louis Science Center, the World Chess Hall of Fame and the St. Louis Gateway Arch monument. Hotel accommodations are suited to please most business travelers. Were located near AT&T, ABB, Panera Bread, St. Louis University and Washington University. Guests can take advantage of business services which include a deluxe boardroom, local catering services, a 24-hour Business Center and free high-speed Wi-Fi Internet access for your convenience. Breakfast is on us when you stop by the Free Express Start breakfast bar for an on-the-go breakfast to start your day and the 24-hour Fitness Center helps keep your fitness routine on task. Experience a great stay in St. Louis, MO when you make reservations at the Holiday Inn Express Central West End. 27 hole golf course located in beautiful Forest Park. The main course has played host to the National Public Links Championship. Iconic attraction of St. Louis. A must see for anyone visiting our town. Busch Stadium is the home of the St. Louis Cardinals, of MLB. ~3 miles from Saint Louis. Presidents, biblical figures, celebrities, and a two-basement Chamber of Horrors. Misunderstood by those who want every wax museum to be like Madame Tussauds. We loved it. ~15 miles from Saint Louis. ~42 miles from Saint Louis.